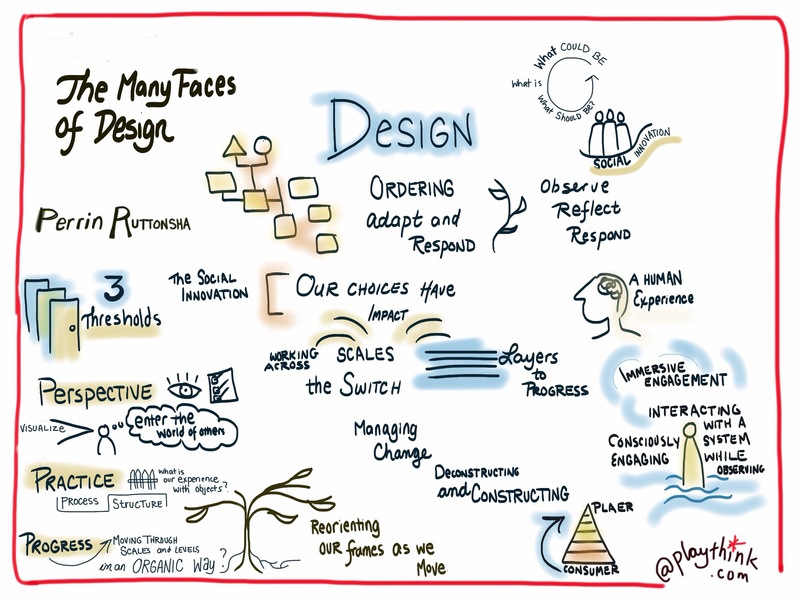 Ruttonsha, Perin (2014) The many faces of design: From adaptive response to creative agency to reflective engagement. In: Proceedings of RSD3, Third Symposium of Relating Systems Thinking to Design, 15-17 Oct 2014, Oslo, Norway. Design is pervasive – both as act and outcome. For this reason, the term itself moves casually across domains, rendering the boundaries of a specific design discipline evasive; especially recently, where those in the field are deliberately extending their expertise into territory beyond that which might be considered a classic design problem space. Against the recent backdrop of surmounting complexity and related social-ecological pressures that arise with population growth and ongoing social-technological development, not only have designers been stirred to reform their own work to address these dynamics, additionally, they are reflecting on the role of design and design thinking in navigating the wicked problems indicative of the contemporary global milieu (Kolko, 2012; Mau, Leonard, J., & the Institute without Boundaries, 2004). In doing so, they are renewing design practice as an increasingly social and strategic process, bidding to occupy the realm of social innovation and large-scale systems transformation. However, social innovation literature indicates that profound social change amidst complexity is not a one-stop operation, neither is it direct, nor prone to absolute control. Rather, it requires alignment across multiple domains, and the order in which this takes place will depend on the point from which one begins, as well as the nature of the barriers and opportunities at hand. As such, a layered, adaptive approach is vital when navigating the dynamics of complex, non-linear systems. Interpreting design through its ‘many faces’ — that is, the many definitions that it encompasses, the ways of thinking and acting that it engenders, the types of outcomes in which it results, and the functions that it serves — is conducive to the development of this kind of flexible and phased approach. Drawing on discourses of resilience, systems, and complexity thinking, this paper embeds an analysis of ‘the many faces of design’ within a social innovation framework, by which to assess them as a series of mechanisms for long-term, adaptive systems transformation. In this regard, designers have begun to consciously codify and extend what are common sense approaches to problem solving and innovation within the umbrella of ‘design thinking’ (Berger, 2009). Moreover, design practitioners acknowledge how their specific choices can have resonant impact at a global scale (Papanek, 1971), yet these cascading effects cannot always be predicted nor specified (Folke, 2006). 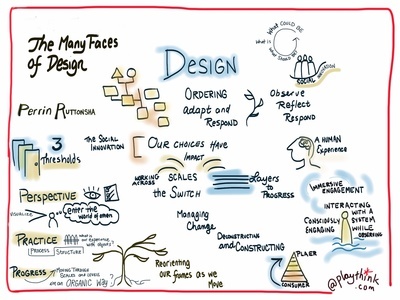 The paper examines the many roles that design assumes — as an adaptive process of sensemaking (Alexander, 1964; Kolko, 2011), as a symbolic mediator (Verbeek, 1970), and as an integrated system — while considering how impetus for the design process fluctuates, from an intuitive response (Alexander, 1964), to an act of creative agency (Mau et al., 2004), to an approach to problem solving required to reflectively synchronize with dynamic, emergent conditions (Brown, 2012).